Mystery Road follows an indigenous detective who on return to his hometown finds himself the sole investigator into the death of a young girl. In Ivan Sen’s gripping, well-acted and admirably patiently crafted police procedural a harrowing mystery collides with national prejudice. This provocative contemporary western depicts the crime and corruption that continues to pollute small isolated towns of outback Australia. Detective Jay Swan (Aaron Pedersen) returns to his Western Queensland country hometown after a stint in the ‘big smoke’, headlong into a case involving a murdered indigenous girl. Wild dogs, heard in the vicinity at the time, and rumours of a suspected drug ring become some of the primary clues Jay follows to every corner of the town leading to the unveiling of further disconcerting operations. He suppresses the prevalent resentment he faces as he investigates – both from the distrusting indigenous community, who have all-but ostracized him and fear he has returned to throw his weight around, and the uncooperative white folk – as well as dealing with a contemptuous and apparently lackadaisical local police force who he is reluctant to entrust. Surrounded by unforgiving, dwarfing nature, the isolation results in the town becoming a breeding ground for criminal enterprises, and the bored and disillusioned youth find themselves easily exploited. As we watch this determined man try to win back his identity and credibility within his former community and prove that he has the skills to make a difference, the suspense mounts. The dusty, ochre-tinted landscape is captured strikingly by Sen’s camera, and he is very interested in surveying the town from an aerial perspective. Jay is made to appear trapped in maze, a claustrophobic hotbed of secrets set to combust if the wrong stone is overturned. But how much do the local police know, and are they turning a blind eye to this illegal profiteering? Are they involved? Jay seeks justice, but finds that only observant old-timers and an excitable forensic specialist supply him useful intelligence. Being a culturally specific police procedural, which addresses a number of issues plaguing Australian lower class outback dwellers – drugs, alcoholism, gambling, youth dysfunction and an unchecked gun culture – and the corrupt white police force overseeing it all, made it all the more fascinating. The well-choreographed final face-off offered up something completely unexpected. 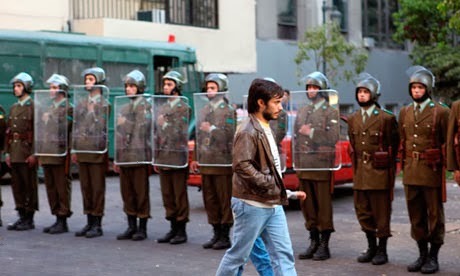 No is an engrossing, behind-the-scenes period docu-drama from Chilean director Pablo Larrain, revolving around the pivotal 1988 referendum to usurp dictator Augusto Pinochet. Gael Garcia Bernal stars as Rene Saavedra, a talented and sought-after ad-man who is poached to lead the creative team behind the NO campaign. Despite pressures up the hierarchy, Rene wasn’t interested in provoking fear or bombarding viewers with the images presenting the negatives of the Pinochet regime, believing a happy, upbeat and colourful tone was the key to winning over the people. Lucho Guzman (Alfredo Castro), Rene’s Boss, and his YES associates view his siding as traitorous and foolish, but Rene accepts the challenge to convince an oppressed nation that the future will be defined by positivity. No is not just a privileged insight into the tumultuous period of Chilean politics and social upheaval, but also a fascinating look into the advertising industry itself – the daily decision-making, the battle of ideas and point-of-view within the creative team, and obstacles such as censorship and political involvement. No is a sublime artistic recreation of how one man’s bold vision and optimism turned the tide for the people of Chile during a period of political and social oppression. Written and directed by Haifaa Al-Mansour Wadjda is the first film to be shot in its entirety on location in Saudi Arabia. It is also the first feature from a female Saudi filmmaker. Admirably honest and unwaveringly optimistic, Wadjda provides fascinating insight into everyday life in the nation’s capital city, Riyadh, and tells a sweet and uplifting tale of the earnest belief in life’s potential and teenage independence within a strict conservative culture. With a striking performance from young lead Waad Mohammed, this heartfelt crowd-pleaser is a very important work of international cinema. At school, Wadjda is rebellious, blatantly disobeying the strict customs that virtuous young women must abide by and she has several run-ins with her upstanding headmistress. On the streets she befriends a local boy and gets herself into many unladylike situations. She swindles her classmates for cash by selling bracelets and mix tapes, hoping to buy the bike herself, eventually deciding to try and win the cash prize offered by the school Quran recitation competition. Her attention to her studies, and the memorizing of the religious verses begins to change people’s perspective of her. During the film we get a sense of the restrictions imposed on women in Saudi society. Wadjda’s mother, as often as she is concerned for her daughter, begins to understand that her culture is in need of some boundary flexing and becomes more accepting of what makes her daughter happy, and challenges social norms. It is the beautiful relationships that are most instrumental in making this a rewarding film. While the film’s gorgeous cinematography and scripted drama removes it from the conventions of neorealist cinema, there is still a sense of natural life unraveling before the camera. The process of making this film must have been very difficult and I have great respect for Al-Mansour’s bravery in fighting to have this film made, for bringing Saudi society to the cinematic landscape and for telling such a lovely story. Stephen Soderbergh's Side Effects is as much a character study as it is a study of a pill-pushing society where pharmaceutical companies have become a super-power. It challenges the involvement that pharmaceutical companies, and their professional minions – medical practitioners (GPs, psychiatrists etc.) – have on mental health treatment and the recovery of patients. Endorsing these specific prescriptions they may try and sway their patients to take experimental drugs at reduced costs to aid their research and consultancy. As a result of this pill-pushing society, Dr. Banks (Jude Law) is publicly blamed for his prescription of Ablixa, who had knowledge that Emily (Rooney Mara) had reacted oddly (but not that it was a documented side effect to the drug) but still didn’t change her prescription. His decision was fueled by Emily’s claims that the drug was uniquely working. We know what happened is not directly his fault, but because he is the trusted expert, he becomes a target for negligence and irresponsibility. Eventually Side Effects becomes an investigative procedural, with Banks just as beset on clearing his own involvement as he is about finding out the truth behind Emily’s health and actions. Banks’ unwavering determination to put his life back together, results in some jaw-dropping discoveries that prove his competency in his field. It is interesting to note that Law actually plays a character in Contagion who manipulates people into choosing one method of treatment (a hoax) for notoriety and material gain. Here, he genuinely cares for the well-being of his patients. He’s an inquisitive man who is a professional first and foremost who has taken on an overload of roles to support his family. There is a lot at stake, and the committed Law is terrific in conveying his growing anxieties. 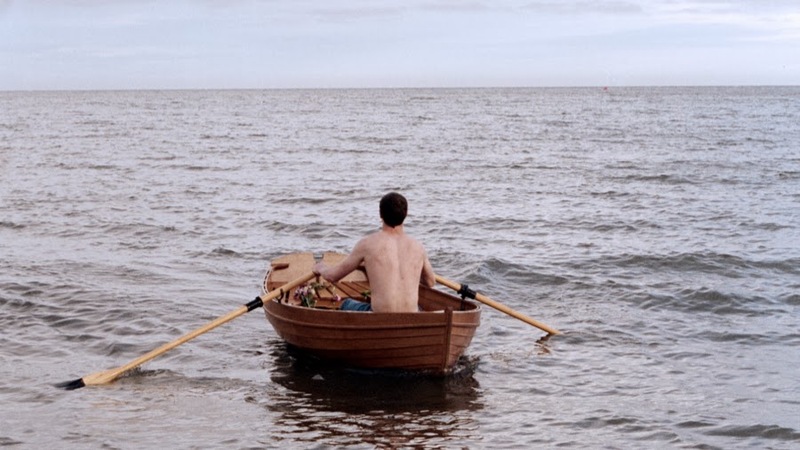 I love the mention of NO, such a great film and unfortunately not one that's been spoken of much (its weird release date placing it on the cusp of 2012 and 2013 didn't help). I'd never considered SIDE EFFECTS in this particular light, especially since I'm never certain what to make of Law's Banks and his inclinations but you do offer so much to ponder on, now. Love your inclusion of The Hunt, that was such a wonderful film. And Side Effects, that fits so perfectly. I'm glad that film is getting some love in the Motifs blogathon, lol. Thanks for the comments Andrew and Brittani. I tried to go with some unique options - I had Oblivion and Laurence Anyways on the shortlist - and glad they fit into the motifs. I'm not sure why I was so drawn to Side Effects; i liked its analysis of a society influenced by pharmaceutical companies (and how Banks became a villain representing that culture).